Celebrating One Truth, Many Paths in the First Byron Spirit Festival! The Byron Spirit festival celebrates our union to each other and the divine. Through aligning our bodies and spirits, it is said that we will co-create an awakening to the present moment and will be sharing this with the world. 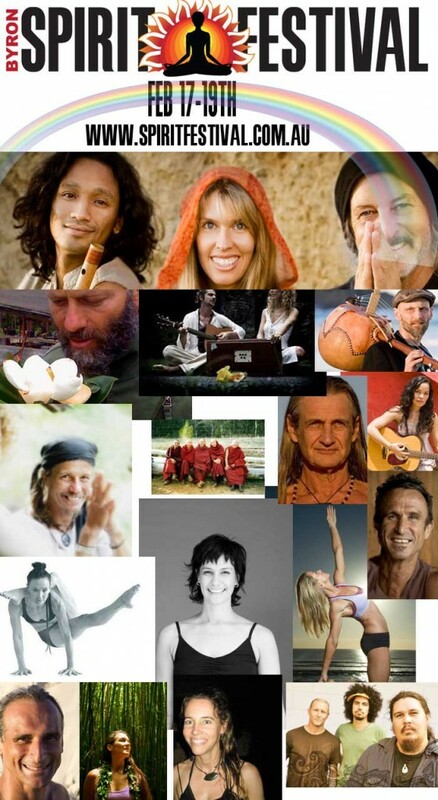 The Spirit Festival is a new, inaugural rEVOLUTIONary event to be held this February 17th-19th, which will be bringing together the worlds of yoga, kirtan, conscious dance, tantra, healing and music to invigorate body, mind and soul. Local, national and international practitioners will impart their gifts within a charming village hub of healthy lifestyle, natural beauty and social awareness. The Festival will will be centered around the Civic Centre in Mullumbimby. There will be a chai and food tent where we will have live music, enlivening discussions and group meditations. The workshops will be based in the many venues within easy walking distance. The Friday night opening ceremony will be at Durrumble Hall, 5 minutes from town. The Saturday night concert will be held at the Civic Centre. Your full ticket entitles you to the attend the entire event including both workshops and concerts. Working with the theme of “Truth is one, paths are many”, the festival will also feature a diverse selection of local healers, artists and musicians with a focus on sustainability and strengthening community bonds. Set over 3 days, the festival will offer participants a wide variety of workshops including yoga classes, lectures and panel and will cater to all levels, from beginners to experienced. Combined with a complete selection of workshops, the festival will also present an eclectic selection of musical offerings featuring recognized artists from the world music and kirtan movement. Amazining yoga workshops with renowned teachers including: Mark Whitwell, Simon Borg-Olivier, Gwynne Williams, Louisa Sears, Lance Schuler, Simon Morocco, Future Sound of Yoga, Julie Smerdon, Katie Manitsas, Mark Robberds, Acro Yogis and many more. Evening Events: Opening night Indigenous welcome ceremony, The Big Dance with The Future Sound of Yoga, OKA, and, and Saturday night concert with Deva Premal & Miten and Manose, Yeshe, and Nomadic Voices. 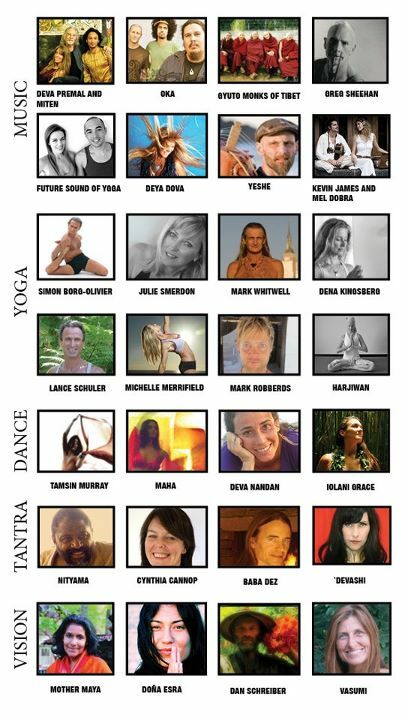 Recognized workshop facilitators and teachers: Featuring national and international yoga teachers and dance facilitators. Eco-Marketplace: Featuring an eclectic selection of vendors with a strong emphasis on fare trade and eco-sustainable products. Global Chai Tent: The chai tent will offer the perfect ambient oasis for attendees and will offer healthy and organic snacks, hot teas and drinks. Activist Alley: Featuring a diverse collection of local non-profit organizations who will share there work with the community. Special activist workshops and talks will also be programmed in. Healing Arts Village: Using the amazing healers we have in the Byron Shire, the healing arts village will provide a gentle and welcome sanctuary for festival patrons and will feature a wide selection of therapeutic healing modalities, including massage, homeopathy, acupuncture and more. Food: Provided by Santos and Rock and Roll Cafe. Inspired by the success of the Mullum Music Festival, Spirit Festival will incorporate and promote the many yoga studios, health clubs, health food outlets, cafes, markets, college and community halls for all the activities over the weekend. The central hubs will be the Mullum Civic Centre, and Santos, with workshops, talks, films, dances and more extending as far out of town as Durrumbul Hall.